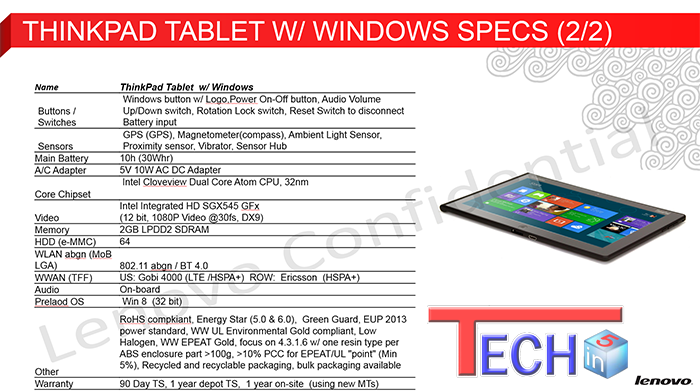 Back in May, Lenovo indicated that the company was working on a ThinkPad tablet running Windows 8. Details were sparse, though--all we knew at the time was that the tablet would have an Intel processor and tie into a cloud service Lenovo is building. 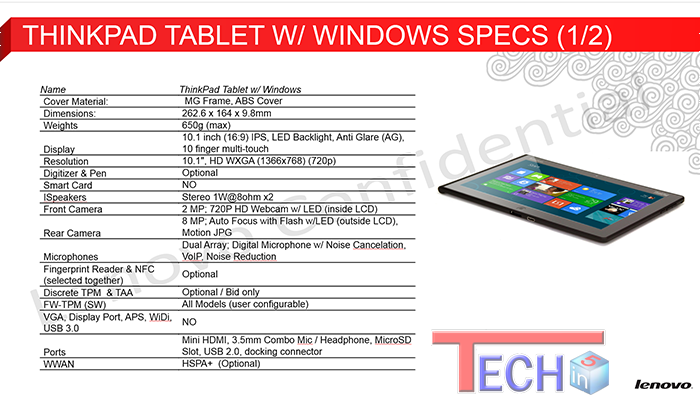 Detailed specs for the ThinkPad Tablet 2 have allegedly been unveiled, thanks to anonymous tipsters (or perhaps just one) leaking internal Lenovo slides to Techin5 and The Verge. The 10.1-inch tablet will reportedly run on a dual-core Intel Clover Trail processor, have a 720p (1366 by 768 pixel resolution) display, and come with 2GB of RAM and 64GB of internal storage. That's twice the memory offered in competing tablets, such as the iPad and Lenovo's Android-based ThinkPad Tablet. However, because the ThinkPad Tablet 2 runs Windows 8, I can't help but wonder if it's enough memory--the tablet-optimized version of Windows 8, Windows RT, may be less RAM-dependent than the full-blown desktop version, but this ThinkPad Tablet 2 appears to run Windows 8 Pro. For the Windows 8 Developer Preview, 2GB of RAM was the minimum required for 64-bit systems. That said, other leaked specs for Windows 8 tablets, such as a Dell version, are also unimpressive in the memory department. Lenovo will be targeting business users with the ThinkPad Tablet 2. Features such as support for Active Directory, device management tools, SD card encryption, and a fingerprint reader reflect this market. A keyboard dock--complete with Lenovo's iconic red pointing stick--turns the tablet into a pseudo-laptop. Like the Android-based Lenovo ThinkPad Tablet, the ThinkPad Tablet 2 is said to offer optional support for pen input vi an active digitizer. At the moment there's no word on pricing or availability, but Lenovo may release this tablet on or around the October 26 Windows 8 release date to compete with the Microsoft Surface and other business-oriented tablets.